Dr. P. Ramakrishna Prasad, M.B.S. A female patient aged 23 years was brought to my clinic with irregularity in periods since menarche .She attained puberty at the age of fifteen and gradually had gain in weight. 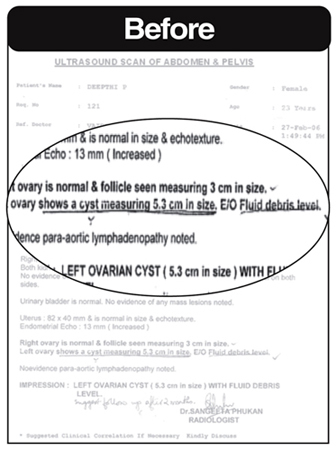 She consulted a gynaecologist few months back and is on hormonal replacement therapy, later at the recommendation of the gynaecologist Ultra Sonogram abdomen and pelvis was done 27/2/2006, which shows left Ovarian Cyst. Menstrual cycle is irregular, delayed once in two or three months and bleeding per vaginum for 4 to 5 days. She is mild and desires cold air, thirst less. I prescribed Pulsatilla 200, as a constitutional drug and raised the potency to 1M later. She took treatment for one year and her periods are regularized. 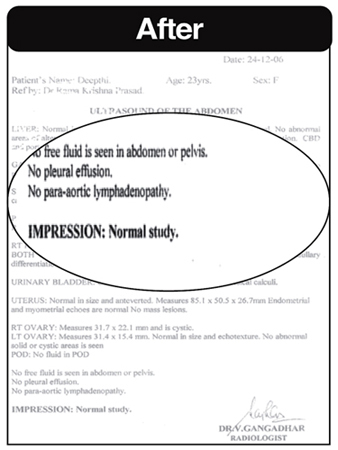 Refer the Ultra sonogram reports taken before and after below.